Now that you have mastered the exercise ball it is time to spice things up a bit. 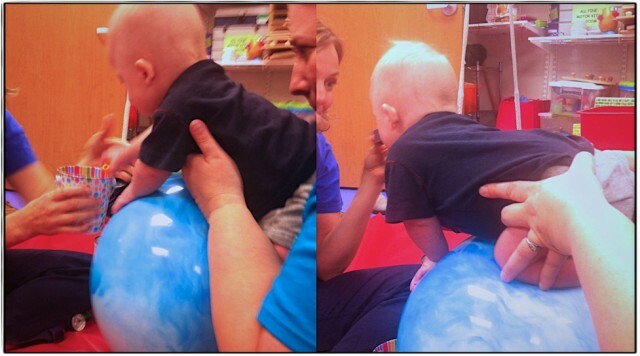 Our therapist doesn’t let Noah just sit around on the ball any more! First, let me talk about one of toys that does a lot more than just bring extra challenges to the exercise ball. One of the best investments we have made, and by investment I mean we spent about 10 dollars, was the Fisher Price Brillant Basics First Blocks. Rick put this on the top Christmas gift listso maybe this made it under your tree. It’s a basket of blocks with a shape sorter top. Why is this such a good investment? Well, it has helped us work on a variety of Noah’s fine motor skills. Granted we aren’t using this box in the videos or pictures, but we use it all the time at therapy and at home. There is obviously more than one way to work on a skill. The first action was simply grasping these blocks in his hand. Your child will advance through various grasps. Palmar Grasp: the entire hand wraps around an object, with the palm of the hand picking up the object. 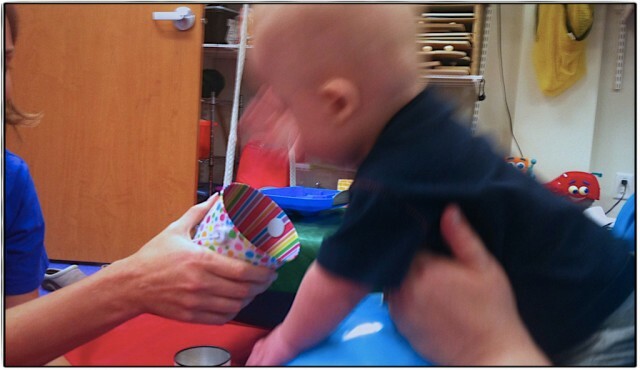 The size and rim on these blocks will allow him to work on all of these grasps, Noah is currently at the ulnar/radial palmar grasp and will on occasion use the radial digital grasp. Knowing where your child is with grasping will help you figure out what to feed them, which toys are best, and other ways to interact with your child. While you advance through grasps you’ll also work on releasing objects. We have worked on releasing in general, as well as into the box. I am not quite sure that Noah realizes he is putting the blocks in the box as we chase his hand around so he has perfect aim. Eventually we will use the sorter on top. He knows what’s in this box now and he gets very excited when we bring it out. He has even picked a favorite color as he will drop them all for a red one. He likes to remove the blocks from the box until there are none left. Then we put them back and repeat. His favorite way to empty the box is to simply dump it over. It is highly efficient. We also work on banging the blocks together, which helps with coordination and stability. We have talked about stability in the core but we are now starting to work on those shoulders and hands. Noah will bang his own blocks, but we also hold blocks out for him to bang. He thinks it is pretty awesome to make noise that way. One other thing it helps us work on is transferring objects from hand to hand. He has not quite mastered this, but we will hold a block out, he will grab it, we will hold another block out on the same side and expect him to transfer the block to the other hand to grab the new block. He usually drops the block to grab the new one, but occasionally it makes it to the other hand. Encourage all of these actions by cheering them on. You will also need to do the activities first to show them what you expect. This is probably the first time we saw Noah mimic us. We would bang blocks, then he would, and we would erupt into loud cheering. It never fails that his version is way cuter than ours. It is obviously a two person job to do this as you cannot hold your child on the ball as well as hold blocks out for them. I am usually helping out during our sessions. But today you get a glimpse of one of our new therapists as she helps out. Yes we had to say goodbye to another occupational therapist, but we are already excited about our new one based on our experience with her so far. P.S. These blocks are also our dogs favorite chew toy, so guard them from your pups. Have you taken any of your previous therapies to the next level? What is your favorite toy to work on fine motor skills? My Aleena (17mo) starting the banging several months ago and now likes how different objects make different noises! We got a house-style shape sorter from IKEA for Christmas – solid wooden bottom and plastic top with 4 shapes. The shape holes are on the sides of the top piece (like windows), so she’s not quite ready for that, but we’ll be there soon. One of her OT’s favorite is simple homemade sorter. She took a recycled cylindrical container with a rectangle and circle cut into the plastic lid (sharp edges filed). Then any palm-sized ball and the lids from frozen juice containers to put in/take out. Easy, cheap and fully entertaining. Wow…a home made sorter…I like that! Thanks for sharing. And…I didn’t know Ikea made sorters….sounds cool! Ooh, this is bringing back memories! Excellent post and so informative! We use shape sorters, puzzles, and the busy box for fine motor development. I also have Ellie push pipe cleaners through the holes of a spaghetti strainer. For spoon feeding prep, I brought a shovel and bucket to the park and encouraged her to scoop the rocks or wood chips into the bucket–it works as she can now eat with a spoon and very minimal assistance! Pipe cleaners though the spaghetti strainer!! I like that, it sounds great! I also like the shovel and bucket idea! We’ll be adding those on our list to try out one day. You are always full of good ideas Anna!!! Keep them coming. yes love the post, it is very informational. It will help when my son gets further into therapy what to expect and I will know what others are doing. I will be able to tell if I am missing something. Thanks. Love the videos. I am glad others are find you to. I appreciate the comment. How old is your little one? Tanks for your comment, glad you are on this journey with us. Regarding your daughters therapy, it’s different for every child, and depends on a variety of different things. Also how hold is your daughter? Aleena is on about an hour/week. My wonderful OT says she is on track and progressing, so nothing more is needed at this point. Voice your concerns to your OT and ped. And if her doc isn’t willing to learn about DS, look for another who is. Our ped was brand new to us when Aleena was born (we met her 1 min before she gave us the surprise diagnosis), so I specifically asked if she was okay with her as a patient at our first follow-up. Wow, I didn’t know there were so much types of grasping!! Thanks for sharing! Me either until I started researching 🙂 I was getting really frustrated with what Noah could eat with his hands and once I understand his grasp it makes much more sense. You guys are awesome! My sister has Down Syndrome and it looks like you all are enjoying Noah as much as we enjoy Emily. She’s almost 27 years old now, but I totally remember those days when she was little (and quite mischievous :)). Thanks for being a light in the world! Noah is as cute as he can be. I read your story on ABCNews.com and am SO impressed! I was very sad to learn that 90-92% of people abort when carrying a DS child. I was blessed with 2 healthy children. I will follow your blog from now on, you and your wife’s commitment to little Noah has touched my heart. What a beautiful little boy you have!! And rightfully you should be so proud! God has blessed you with an enormous gift! Those eyes!! Take care and God Bless you all!! Thank you for the kind words. So glad you found our site, and glad you decided to stick around to follow our journey. We are excited about sharing our story with everyone, and glad you going to be following along. You guys are awesome! My sister has Down Syndrome and it looks like you all are enjoying Noah as much as we enjoy Emily. We are sure to try this one now so we can surprise the therapist! By the way, Enzo is now starting to sit up on his own! We can’t believe it. He doesn’t fall to the side anymore and can lift himself up if he falls forward! This is so much fun to watch! I think that Noah is ready to use a “Velcro bottle”. You attach small toys to a bottle (with handle)using velcro. He will learn to stabilize the bottle with one hand while pulling off the toys. the pulling gives sensory feedback, builds strength and is fun. Kids love velcro so it is great to incorporate in these types of fill and dump activities that develop eye hand coordination. Use larger pieces of velcro to increase challenge. It’s great to have the definitions of the different types of grasps.. not that I’ll remember. I get tired of asking, ‘what’s that mean again?’. Colton is right around the raking grasp. He’s a little better with the left hand. We’ve been trying to incorporate turn-taking into learning to release. He just started crawling this week, so who’s knows what will be coming next. I love these times when they start doing a whole bunch of things at once!